Read the posts for full details, but the short of it is the main Monkey Rule Book is now 88% fully through its first editorial/proofing pass, we are art complete, so layout and final check are all that stands between release in Feb for backers/March for general release. Mandate is not far behind, so I anticipate that should be April/May. Then monthly/Bimonthly releases for everything else (Ministry of Thunder adventure book, Golden Book of 101 Immortals supplement, Monkey Companion and Dragons Ascending to Heaven). 2018 is finally the year of the Monkey. 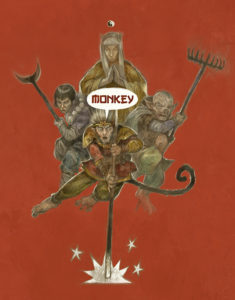 Another thing to look forward to I’ll be running the Mega Monkey in the form of The Mandate of Heaven at the upcoming 7 Hills (Sheffield March 24-25) and Continuum Conventions (July 20-23), in its three table version. 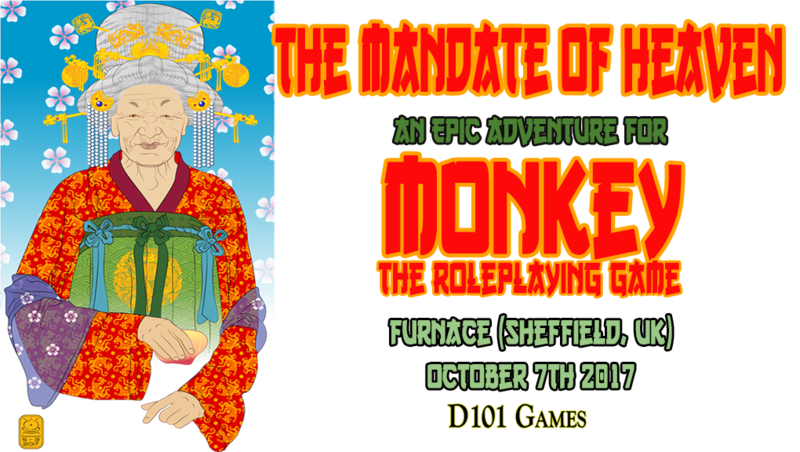 Then Mandate gets retired and Ministry of Thunder takes over for a short run over Furnace (Sheffield October 7-8 ) and possibly Dragonmeet.. This is done but I’ve been holding off releasing this publically until one month before the rulebook book is ready. 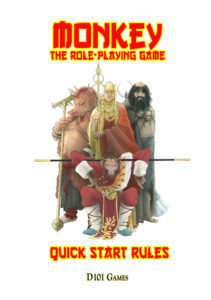 This 50-page pdf has a concise version fo the main rules, enough to play an included example adventure with two sets of four premade characters. The first set being the characters from the book, i.e. Monkey, Pigsy, Tripitaka and Sandy. The other being the sort of diverse set of four characters you can create using the rules in the main rulebook. Finally, if all this isn’t enough to cheer you up during the grey month of January, here’s the last bit of art that Dan Barker did for the main rulebook, the Boy-God Demon Hunter Prince Natha. This Monkey Monday I’m busy updating the Kickstarter backers of where I’m up to. Monkey the Roleplaying Game has gone to final proof is more or less art complete (in the sense I might go “Oh I need a picture of the Jade Emperor!” i.e. last minute stuff) and I’m expecting to have the pdf out and to backers just before or just after Christmas. 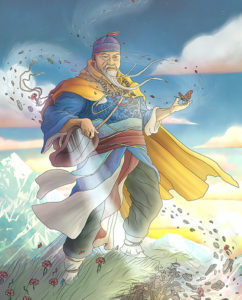 Here’s the Wind Lord Feng Po as drawn by Peter Frain, one of the last batch of art. The Mandate of Heaven got its first run through of all three worlds running on three separate tables running in parallel at Furnace back at the beginning of October. The Great Hall of Games! Dan Barker has done illustrations of all 15 pre-made characters. Here’s Inevitable Sunshine from the Western Heaven. Read more at the Mandate of Heaven Kickstarter update. Over a day and a half, while I was researching for the Mandate of Heaven (which I co-ran with +John Ruddy and +Lynn Yin at Furnace in Sheffield last weekend), I’ve learnt what an absolutely fucked place/concept the Chinese 10 Courts of Hell are. A place of torment where a system of Judges assigns you a very specific chamber of hell to be burnt/cut/pulverised in. And where after serving your sentence you drink the soup of forgetfulness and get reincarnated according to the rules of Karma into your next life. So a basic mix of extreme bureaucracy, the tales of red tape gone wrong are amazing, and demonic fury. But what really gets me is the little touches. Such as the City of Innocents, where souls of those murdered, raped, etc get to live out their time watching the punishment of their tormentors in life! Its all meat for the grinder, but I wonder how I’m going to keep Monkey’s usual light comedic tone, without it all going Carry on Hellraiser! Furnace this weekend coming, so here’s the information about the three tables that the Mandate of Heaven runs across. You will need to sign up for a ‘table’. 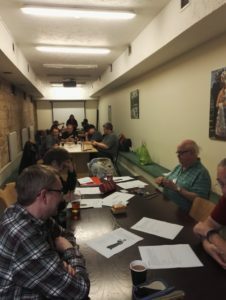 This means we’ve got table allocation done before the game starts and we can get down to playing as quickly as possible.Have a read of the intro for the adventure being run on the table, the type of player characters (or immortals as we call them in Monkey) and the Style. The last bit is important. 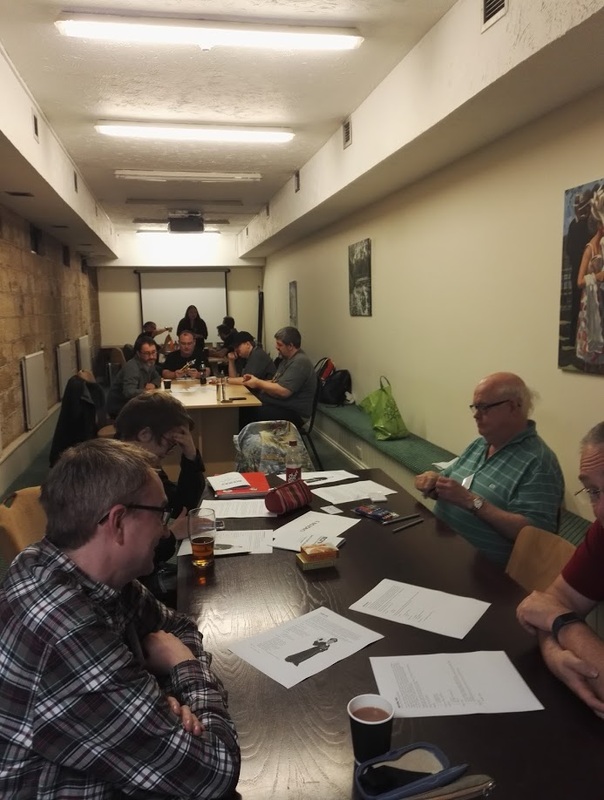 When we sat down to discuss the game, and who was running which table it became clear that not only the tone of each table would be different due to the setting/city, but the style of each Narrator would be different. Therefore we’ve tried to sum up this up in as Style. Please bear this in mind when you sign up. Note none of this changes the tags that I provided Elaine with initially: Comedy, Humourous, Hyper Asian Action, Chatty, Mythic, Rules LIte. Even the 10 Courts of Hell, still broadly fits these tags, despite its darker tone. If you have pre-booked, please let me know (newt@d101games.com) which table before the convention. Someone has been stealing the peaches of immortality from the Queen Mother of the West’s garden. You’ve been summoned to her court for an audience. While her two tame(ish) Tigers prowl in front of her, she explains that with the Peach Party to which all the august immortals of the Western Heaven are invited to coming up this is not a good thing. She remembers the last time when ‘you-know-who’ stole peaches and spoilt the party for everyone. She clenches her fists and fiercely proclaims that this is not to happen again! Therefore, she is dispatching your small group of investigators from the Ministry of Thunder to the Peach Garden to find out what is going on. Who are the player immortals? Members of the Ministry of Thunder, who are responsible for investigating and supernatural crimes in both the Western Heaven and on Earth. They report to the monstrous bat-winged and crow-headed Lei-Gong, the God of Thunder. The Celestial City. This is the capital city of Western Heaven floating in the clouds above the holy mountain of Kunlun. Its buildings are made of Jade and precious metals. From its public fountains, flowing liquid silver and gold. It is a top-down city where the palaces of the Jade Emperor and the Queen Mother of the West, sit at the top. Then you descend through the palaces of the greater immortals, then the administrative hub of Ministries, private gardens and public parks and finally the residences of lesser immortals, such as the player immortal. Schemeing political intrigue, smart social intrigue, punctuated by Kung Fu takedowns. Peaches! Peaches! Who will buy my Peaches! You stand In the back room of the City God’s Temple. A ragtag group of civic immortals, responsible for the smooth running of the great cosmopolitan city of Chang’an the capital of the great Tang Empire. Your boss, Little Wing the City God is notably agitated. Normally he’s engrossed in the city’s vibrant culture, it’s beautiful fashions and good food from the Empire and beyond. But today he’s worried by reports that Peaches of Immortality have been going missing from the Queen Mother of the West’s garden up in the Western Heaven. 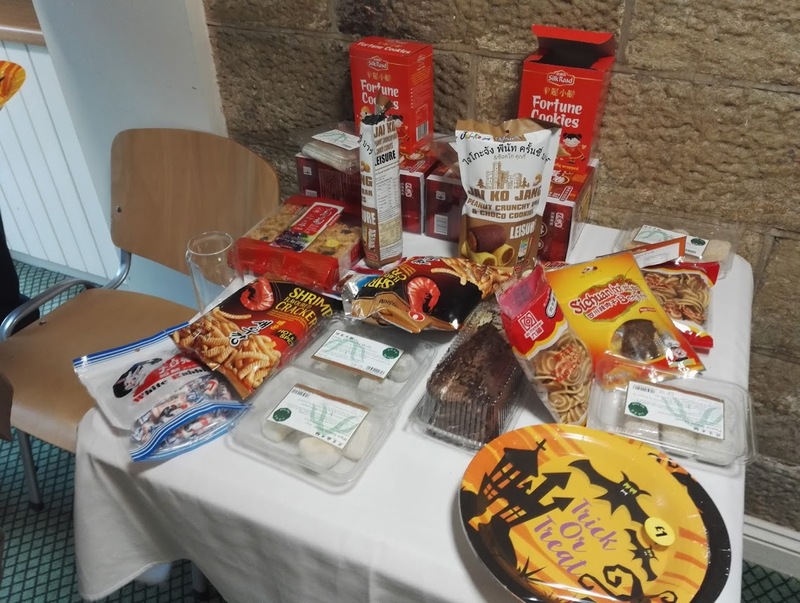 The fact that one of the local Triads has been trying to sell “Peach Treasures” to local dignitaries and underworld figures is an unhappy coincidence that he can’t ignore. They are doing it openly in the Great Market! Without a license! What if a demon was ever to eat one! Poor dear is practically in tears, guess who is going to be assigned the job of catching the villains and squaring it with them upstairs in Western Heaven? 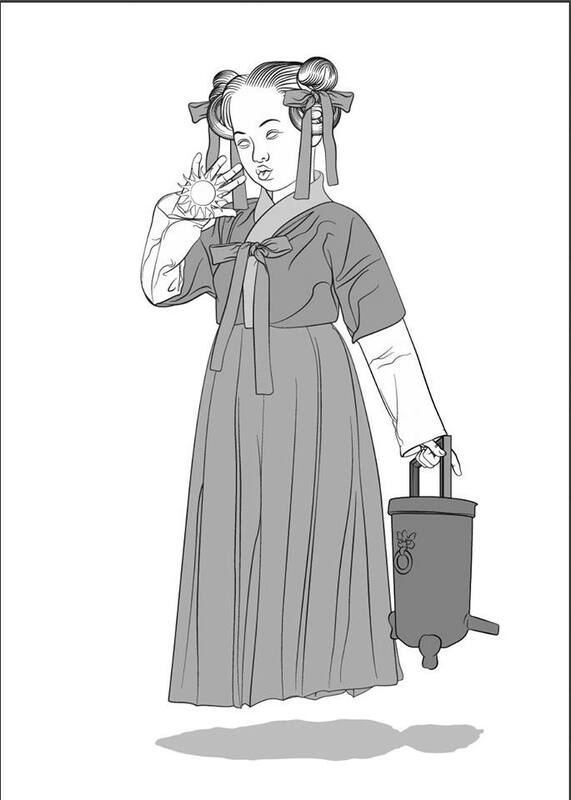 Chang’an the cosmopolitan and peaceful capital city of the Tang Empire. Where Chinese citizens, rub shoulders with Turkish merchants and other foreigners from beyond China’s borders, which are at the highest during this dynasty. This is a walled city, made up of districts whose inhabitants maintain mudbrick walls, and keep the businesses and purpose strictly contained. Visit the Temple Districts, where Taoist and Buddhist temples co-exist peacefully. The Administrative and Pleasure Districts sit side by side, and the walled Imperial city of the Emperor’s court dominates the Northern Part of the city. 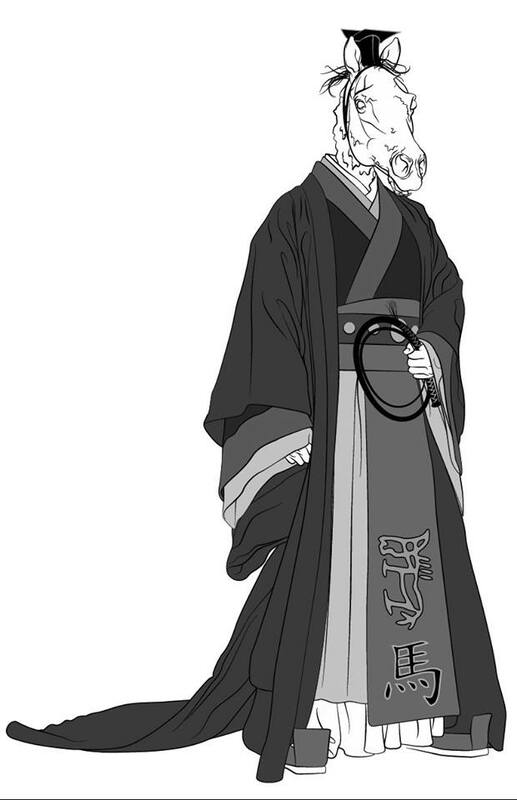 The staff of the City God, Little Wing, who is responsible for maintaining balance and Harmony within the Imperial Capital, unseen and unnoticed by the mortal populace. The sign hung on the wall above the City God’s desk, does it not say? 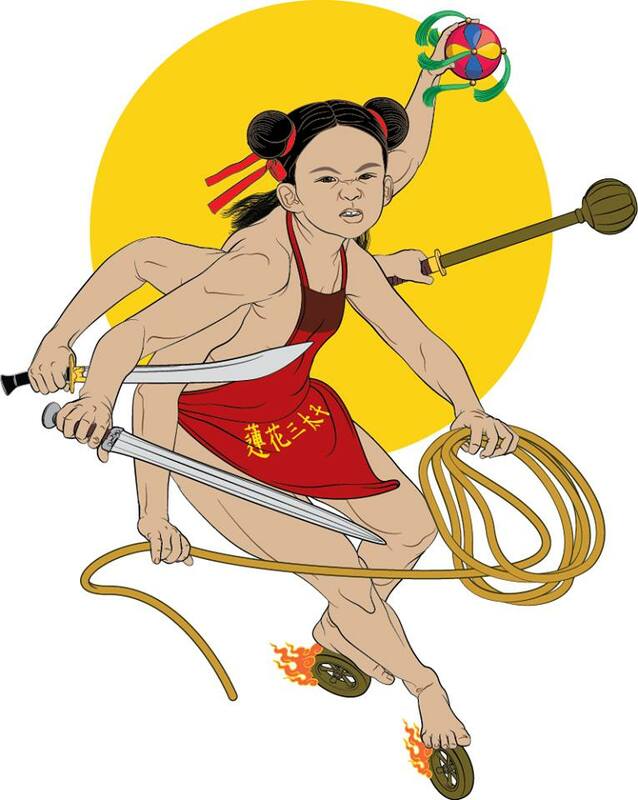 Humorous and to the point investigation, mixed with fast-paced Kung Fu action. The Twelve Hells aren’t meant to be soft on the damned. They are supposed to be places of pain and suffering where evildoers are punished for their crimes on earth, in a hell particular to their crime, for a set amount of time, until finally they drink the potion of forgetfulness and are reincarnated into a new life. Its ruler, King Yama, is furious. Something is not right in the Twelve Hells. Recently It’s not all screaming and eternal torture. There seem to be outbreaks of harmony and order. There are even tell-tale signs of sweetly perfumed flowers blossoming in the usually despairing dingy soot infused atmosphere. He can smell the faint whiff of Hope. The absolute ruler of the Ten Courts wants you to investigate this…’niceness’ and put a stop to it. You Do, literally the City of Darkness. Similar in structure to the Chinese Cities on Earth above, it is surrounded by perpetual and total darkness. Within its walls are the Ten Courts where the dead are judged by the Judges of Hell and then sent to one of the Twelve Hells specific to their crime. Beneath the city is the is the Incessant Hell, a vast cube buried in the dark earth where criminals whose crimes put them beyond redemption are held for all eternity. You are Demons of the Ten Courts of Hell. Responsible for punishing the evil doers, guarding the damned, and capturing escapees. You report to one of the Ten Judges of Hell. Dark Comedy, Sinister Black Humour, Bone Crunching Action.